This entry is part 7 of 7 in the series Glorious Greece. There are many sites, around the world, known for their changing of the guard ceremonies. 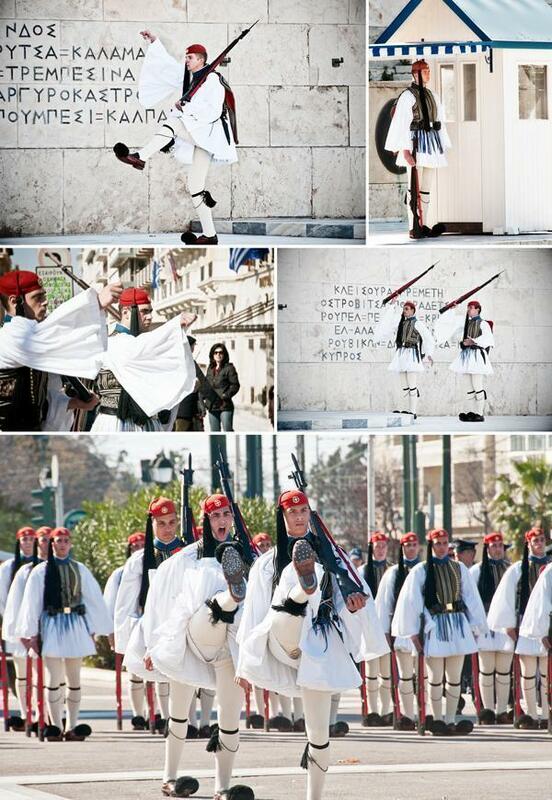 Certainly, the most unique is the Grand Change of the Evzones – the changing of the Guard in Athens, Greece. 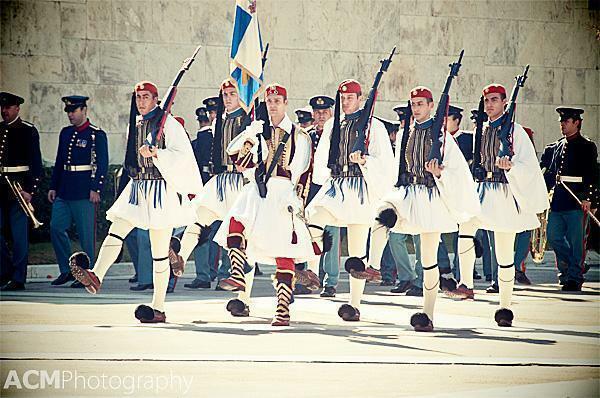 The Evzones, or Presidential Guard, is an elite unit of the Greek army that guards the Tomb of the Unknown Soldier, in front of the Hellenic Parliament building, and the Presidential Mansion. 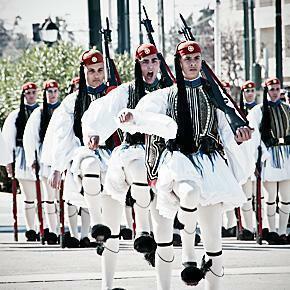 The unit, also known as the Tsoliades, was founded in 1868, although their roots reach back to the Greek War of Independence. 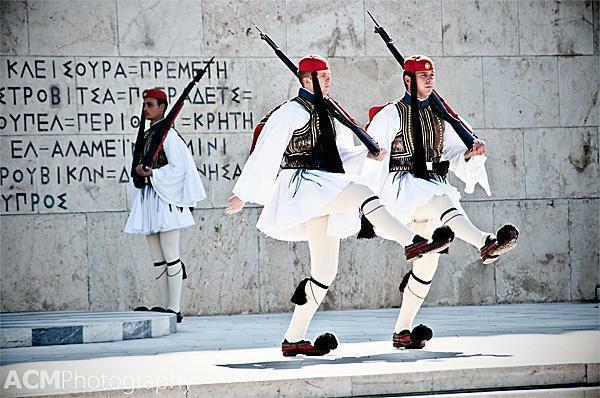 Two Evzones guard the tomb around the clock and trade positions every 15 minutes, remaining motionless the rest of the time. In fact, they are so well trained one Evzone’s uniform even caught on fire after a Molotov cocktail was thrown at the guard house. The guard didn’t move until he was ordered to. That’s dedication! Every hour there is a changing of the guard. The movements are highly stylised and resemble an elaborate dance. It is said they are done in slow motion to preserve the guard’s circulation after standing completely still for one hour. It is fascinating to watch. 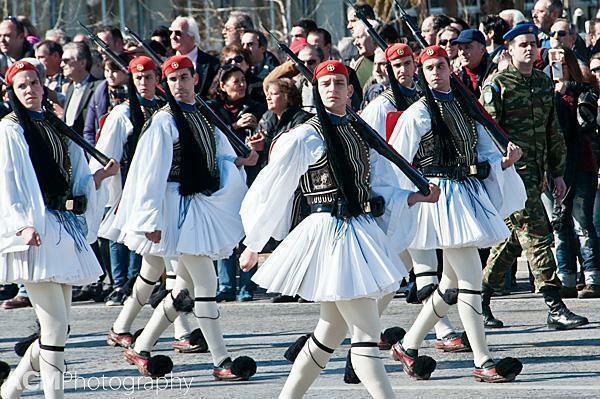 Their unique and rather bizarre uniform includes the kilt-like foustanella, which has 400 pleats to represent the 400 years of Turkish occupation. It is worn with white wool stockings with black tasselled knee garters, a red cap with a long black tassel, a white undershirt and red leather shoes with black pompons. Each uniform takes 80 days to create, by specially trained craftsmen. Check out those clogs and pompoms! Sunday mornings at 11:00 there is a Grand Change which includes the entire guard marching from their barracks with a marching band. This is the most interesting time to visit, but also the most crowded so you should stake out your position early. If you’re planning a trip to Athens, be sure to check out some of our other articles in the ‘Related Posts’ section below. 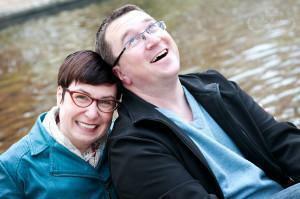 Don’t forget to sign up for our free European Travel Ezine, CheeseWeb Escapes. 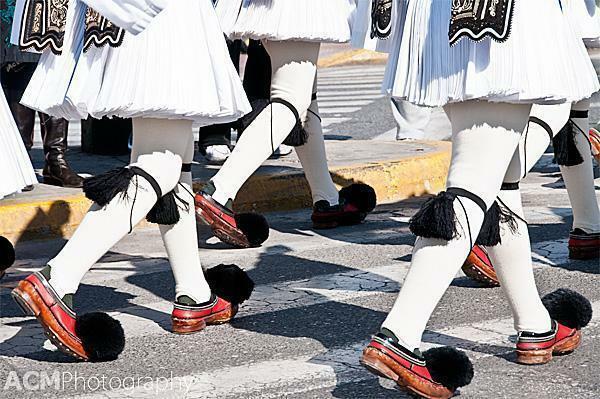 Athens was our featured destination and you can find it in the Ezine archives once you subscribe.